Like in many other spheres of life, we are finding that our current mode of practice is getting challenged as technology and the explosion of knowledge provide far better insights on some very old concepts. In many aspects, a clear rift is beginning to develop between past and present. Medical research and clinical science however, have been advancing steadily and have been finding the answers that many optometrists have not quite caught up to. There is predominantly the current prescription practice, which dates back to the 16th century and has mostly gone completely unchanged since. It may require a paradigm shift away from the mainstream establishment if we wish to remain meaningful and survive as a profession in this global village of ours. These may seem hard words, but let us look at a simple example: more and more patients are now asking for their number – meaning their script. They, will then take this and order their glasses over the internet and may even get it sooner and cheaper than what your own laboratory can provide. In certain countries “over the counter” myopic glasses are selling far more than readymade readers. I have no doubt that practices focusing on retail aspects and even willing to do free eye examinations will face an uncertain future. Get myopia glasses first pair FREE to try! We offer various fashionable yet cheap myopia eyeglasses & frames for men & women like reading glasses, etc. To understand why we may have to be different we need to investigate changes in eye care requirements. We are living in a world where people are getting older and may have specialised vision care demands. On the other side of the scale, we have the children of today [Generation Z or digital natives] spending far more time on near point tasks that may impact on their visual system. To find these answers we need to look at the needs of our current patient base. Over the years, numerous studies have explored the epidemiological aspects of vision but the two studies that I find most significant are the Beaver Dam Study and the COMET Study. The Beaver Dam Eye Study was funded by the National Eye Institute in the USA. The purpose of the study was to collect information on the prevalence and incidence of age-related cataract, macular degeneration and diabetic retinopathy, which are all common eye diseases causing loss of vision in an aging population. The study was designed to discover (or detect) causes of these conditions. The study also examined other aging problems, such as decline in overall health and quality of life and development of kidney and heart disease. This study was conducted over a period of 15 years and resulted in more than 300 publications. The data provide population-based estimates of the cumulative 15-year incidence of loss of vision over a wide spectrum of ages. Eight percent of the population developed impaired vision (20/40 or worse). In people 75 years of age or older the cumulative incidence of visual impairment accounting for the competing risk of death is 25%, of which 4% is severe, indicating a public health problem of considerable proportions [as the US population in this age is expected to increase by 55% from 18 million in the year 2005 to 28 million by the year 2025]. 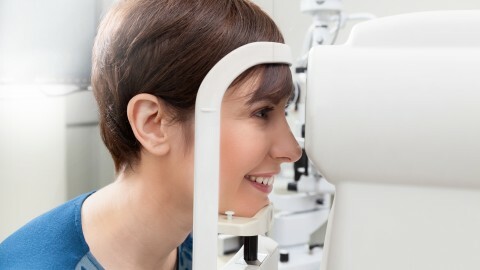 For optometric practice, the challenge is how to deal with this increase in visually impaired patients and how to use technology to manage this condition. One surprising outcome of this study was the significant decrease in myopia among individuals aged above 43 years. The prevalence of myopia decreased from 42.9% in adults aged 43–54 years to 25.1% in adults aged 55– 64 years, further decreased to 14.8% in the 65-to-74-year age group, and then slightly decreased to 14.4% among individuals aged 75 years and above. The cause of this age-related variation in the prevalence of myopia is still under debate but it may contribute to our understanding of the aetiology of myopia. The main question is whether this this age-related variation in the prevalence of myopia results from longitudinal effects or cohort effects. However, the bimodal distribution is likely owing to differing influences of axial myopia among younger people, and greater index myopia, due to lens nuclear sclerosis in older people. Changes in axial length may suggest a strong environmental influence in myopia that may be reversed in presbyopia. In my own practice, a reduction of myopia between the ages of 50 and 60 years has now become the rule rather than the exception and to find myopia reduced by as much as -1.50D over this period is not unusual. Be on the lookout for this and you may find patients swopping their Multifocals for reading glasses only. In the COMET [Correction of Myopia Evaluation Trial] study Gwiazda and co-workers investigated the effect of accommodation and related risk factors associated with myopia progression along with interaction with treatment in children over a period of three years. This was a prospective, randomized clinical trial that evaluated the effect of progressive addition lenses (PALs) compared with single vision lenses (SVLs) on the progression of juvenileonset myopia. Children with larger accommodative lags (>0.43 D for a 33 cm target) wearing SVLs had the most progression at 3 years. PALs were effective in slowing progression in these children, with statistically significant 3-year treatment effects (mean +/- SE) for those with larger lags in combination with near esophoria (PAL – SVL progression = -1.08 D – [-1.72 D] = 0.64 +/- 0.21 D), shorter reading distances (0.44 +/- 0.20 D), or lower baseline myopia (0.48 +/- 0.15 D). The 3-year treatment effect for larger lags in combination with more hours of near work was 0.42 +/- 0.26 D, which did not reach statistical significance. Statistically significant treatment effects were observed in these four groups at 1 year and became larger from 1 to 3 years. 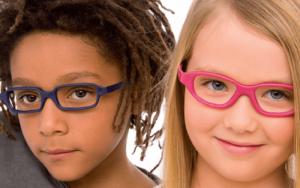 The results support clinical practice in the United States where children with large lags in accommodation and near esophoria are often given PALs or bifocals to improve visual performance. Results of this study suggest that such children, if myopic, may have an additional benefit of slowed progression of myopia. Like with most things in life, this study has it supporters and critiques. Again, from my own experience, I tend to agree with these results except for the use of PALs. Criticism against this approach often stems from the use of PALs that provide variable results. 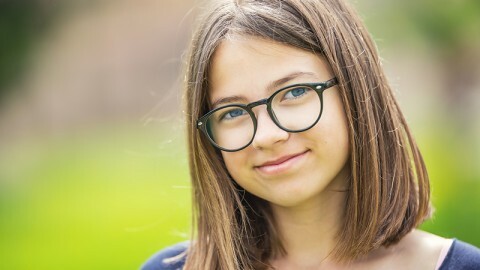 Children with active accommodation systems will not get a “warning signal” when looking through the wrong portion of the lens and would therefore still experience a significant increase in myopia. 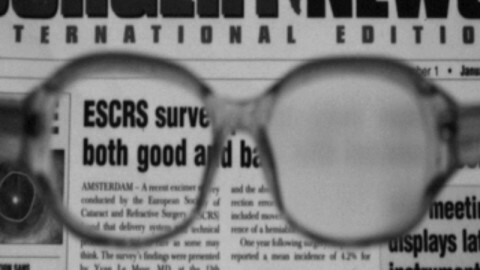 Studies on myopia dominate scientific literature in eye care and with good reason. Myopia has now been described as the most common eye condition in the world and number one on the list of prevention of blindness. According to the World Health Organisation, eight out of ten children may become myopic by the age of 16. It poses massive public health, social, educational and economic consequences. By some estimates, one-third of the world’s population — 2.5 billion people — could be affected by short-sightedness by the end of this decade. “We are going down the path of having a myopia epidemic,” said Padmaja Sankaridurg, head of the myopia programme at the Brien Holden Vision Institute in Sydney, Australia. Studies on myopia dominate scientific literature in eye care and with good reason. Myopia has now been described as the most common eye condition in the world and number one on the list of prevention of blindness. According to the World Health Organisation, eight out of ten children may become myopic by the age of 16. It poses massive public health, social, educational and economic consequences. By some estimates, one-third of the world’s population — 2.5 billion people — could be affected by short-sightedness by the end of this decade. “We are going down the path of having a myopia epidemic,” said Padmaja Sankaridurg, head of the myopia programme at the Brien Holden Vision Institute in Sydney, Australia. It is also interesting to see how results from epidemiological studies done before 2000 differ from studies done in the last 10 years and it confirms this dramatic increase. Myopia is probably the best example of the rift between past and present thinking. Not so long ago, I was heavily criticized for suggesting that myopia is far more environmental than genetic. This nature vs. nurture debate is still ongoing with the old traditionalists still considering it as a genetic “illness”. The simple fact is that the human genotype takes thousands of years to evolve and adapt and can therefore, not be the reason for the exponential increase in myopia. This can only be the function of the phenotype – or the interaction between humans and their environment. The old guard now refer to myopia as “a polygenic multifactorial disease governed by both genetic and environmental factors”. I do not feel comfortable with the use of the word disease. This, however, leads to the following debate: can it be cured, controlled or prevented? My own research clearly shows that it can be prevented or controlled in most children. The exceptions are the pathological myopes which to my mind are the only true genetics ones. This is in line with a more modern take on myopia that is beginning to take shape, which suggests that myopia is not an illness at all. Rather than being an illness, it is becoming more evident that myopia is first a symptom of eye strain, and later, with the current outdated “treatment” methods, becomes a response to defocus stimulus. Concepts such as Nearwork Induced Transient Myopia [NITM] are now becoming generally accepted but researchers are still arguing whether it derives from changes in axial length or accommodative issues. This argument is rather important because it forms the cornerstone when considering modalities for the prevention or controlling of myopia. The prevention of myopia is a topic on its own and there are no simple answers. It requires, amongst other factors, an evaluation of accommodative and vergence functions and esophoric children may be treated differently to exophoric children. We will have to rethink the use of low plus [+0.50] lenses. While I also supported this concept it has now shown to have limited success with generation Z. The use of visual therapy in the control of myopia has again been rejected by most researchers and we will have to seriously reconsider this practice. Other than the two major issues of dealing with an increase in the older population and myopia we, as optometrists, need to rethink several other aspects. As previously stated the retail part of the business is already under attack. Not just from online buying but also from other new technologies and approaches. The pharmaceutical industry has taken a special interest in eye care to find alternatives to spectacles and contact lenses. Although I do not agree with several of these “solutions” it is out there and will become more common soon because of strong social media exposure. The use of eye drops to prevent/control myopia serves as a good example. The use of eye drops to reduce pupil size and therefore create good depth of focus to postpone the effects of presbyopia is also available. The use of an orthokeratology lens for a couple of days after which an eye drop maintains the corneal shape could have been on the market earlier if the enzyme they used was not of bovine origin, creating a concern about the transfer of mad cow disease. It is not just Optometry but also Ophthalmology that will have to take note. According to a study published in Nature, eye drops to prevent/cure cataract formation is now in its final phase of testing and may even be available next year. While on the topic of pharmaceutical products, I have to also refer to the whole ADHD debate and the use of chemical substances to control the symptoms. Yes, indeed, it does not provide a cure – it only control symptoms. This is another battle field between nature and nurture and again the same principle applies. The global explosion of children that now appear to suffer from ADHD in its different forms cannot simply be seen as genetic disorders. Most of the diagnoses are anyway done on symptoms alone and not on genetic analysis. It impacts more on boys than on girls but sadly the number of young girls that are now going on anxiety or anti-depressant medication is shocking. The sad thing is that, I believe, money drives most of these arguments. The Centre for Disease Control [CDC] in the USA estimates the treatment costs of ADHD and the personal and societal costs to be $31.6 billion per annum. This includes health care for persons with ADHD specifically related to the diagnosis; Health care for family members of persons with ADHD specifically related to their family member’s diagnosis; and work absences among adults with ADHD and adult family members of persons with ADHD. I admit that because of this I have developed a total adversity to children being labelled ADHD and made it my mission to remove these labels with obvious criticism from several quarters. I believe my persistence is paying off since more and more researchers are now questioning this. Recently I got hold of a statement made by Jerome Kagan. This gentleman was a professor in Psychology at Harvard University and a couple of years ago he was rated as one of the most influential psychologists of the 20th century. He ranked higher than Carl Jung [founder of analytical psychology] and Ivan Pavlov [pavlovian reflex]. In an interview with Spiegel he stated that “the diagnosis of ADHD is an invention and only benefits the pharmaceutical industry and psychiatrists”. He continues by saying that this inaccurate diagnosis has a devastating effect because the people think there is something fundamentally wrong with them. Needless to say, I whole heartedly support these statements. The obvious question is what does this have to do with optometry? From my own research and results, I have no doubt that a significant part of these symptoms relates to poor visual skills. If we wish to practice with purpose this is an area to be explored. 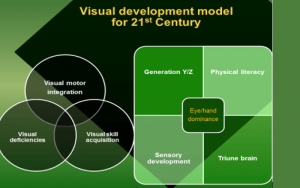 To understand this we need to design a new visual development model for the 21st century and practise accordingly. The last example I want you to think about is the multifocal lens. I am sure I am not the only one who has to listen to patients and their frustrations with their multifocal. This technology dates to before computers became a house hold item. It was intended to provide good distance and near vision and some reasonable intermediate vision. Now that many people are spending most of the day on computers, they have to make use of the weakest link in the lens and it is no wonder that they are unhappy. I am aware that companies are spending lots of money to improve the design but in doing so they may follow the route of so many other companies that could not adjust to the 21st century. If you go and read the history of Kodak cameras you may understand. Soon we may see someone making a paradigm shift and come up with a completely new technology to solve this challenge rather than improving old technology. This article stems from some talks I gave on this topic. It is certainly not my intention to be seen as a doomsday prophet but rather to provoke some thinking to overcome these challenges. Yes, to me, they are challenges not threats. In upcoming articles I will deal with specifics in these areas. I have also been asked to do a series of CPD lectures on these topics. If you are interested please drop me a line. List of References used in this article. 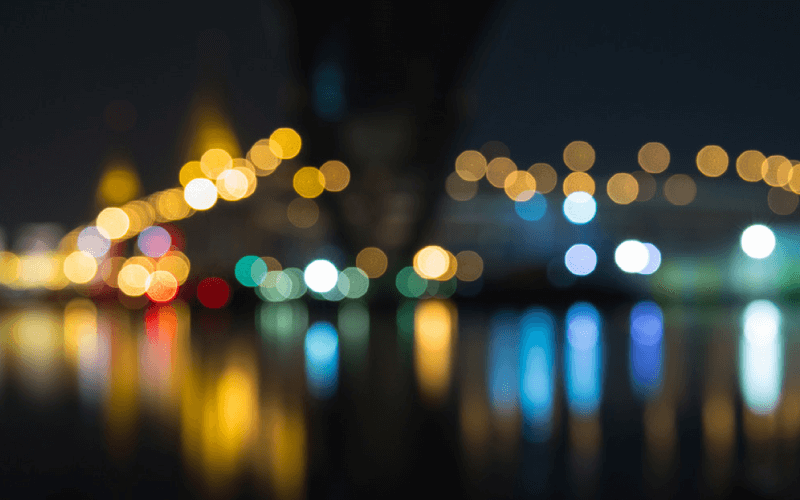 The case of mysterious disappearing vision….? !